Riley Lees takes on a tackler. The redshirt freshman receiver matched a career high with three catches against Maryland. While senior running back Justin Jackson was busy breaking Northwestern’s all-time career rushing record in last weekend’s win over Maryland, another group of players quietly found its footing. The Wildcats’ (3-3, 1-2 Big Ten) receiving corps poked holes in the Terrapins’ secondary all afternoon, bouncing back after struggling in the team’s first two Big Ten games and allowing junior quarterback Clayton Thorson to finish with 293 passing yards. Senior receiver Macan Wilson and sophomore superback Cam Green notched career-high catch totals in the victory, and redshirt freshman receiver Riley Lees tied his mark. All told, it represented the type of performance the deep but fresh-faced group will look to replicate as it wades deeper into the season, starting with a pivotal game with Iowa (4-2, 1-2) at Ryan Field on Saturday. Thorson does not lack for receivers to connect with this season. He hit nine different targets at Maryland, and has completed passes to at least seven each game this season. But it has still been an up-and-down first half of the campaign for a wideout group adjusting to life without the graduated Austin Carr, Thorson’s old favorite receiver and the Big Ten’s leading pass-catcher a year ago. Described by coach Pat Fitzgerald this week as “developing,” the team’s receiving corps is headlined by Wilson, shifty junior Flynn Nagel and 6-foot-4 sophomore Ben Skowronek. The trio has impressed at times, such as the season-opening win over Nevada when Skowronek amassed 123 receiving yards and Fitzgerald gushed about the team’s depth at receiver. But since the opener, the group has struggled at times to get open for Thorson, with the signal caller’s completion percentages plummeting in losses to Duke (37.9 percent) and Penn State (52.8 percent). In NU’s Big Ten opener, Wisconsin waxed NU in Madison and the Badgers sacked Thorson eight times, a number influenced by the wideouts’ difficulties getting separation. Then came the rebound against Maryland. Wilson echoed the sentiment Tuesday. He said the group had not “done what we needed to” against Penn State and Wisconsin but called itself out and had a great week of practice going into the Maryland game. 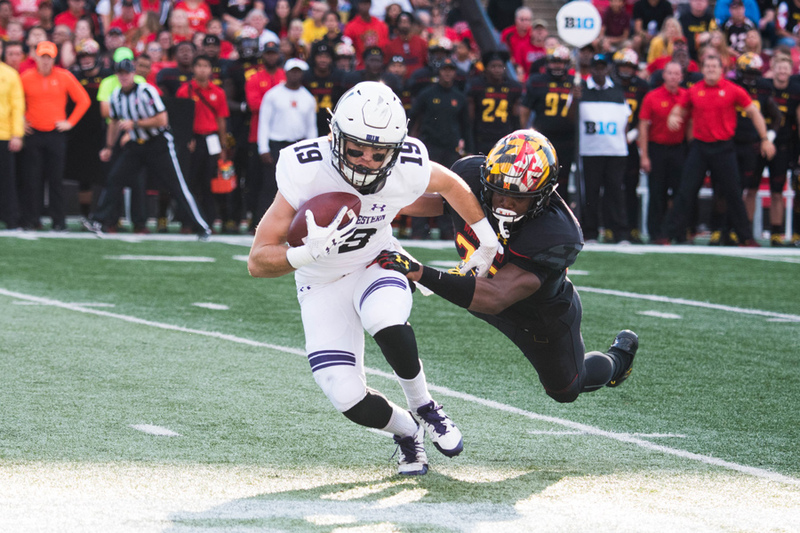 Lees, the freshman who hauled in three catches against the Terrapins, said this week that the group is growing more in-tune with Thorson as the season rolls on. Still, NU’s passing attack has faltered in its two battles with vaunted Big Ten defenses. Maryland currently sits in last place in the Big Ten in passing defense. The Iowa defense more closely approximates Penn State’s and Wisconsin’s, and Fitzgerald did not hold back in praising the Hawkeyes’ secondary. On his side of the field, Fitzgerald said his receivers are looking to improve and to smooth out the inconsistencies they’ve displayed thus far this fall. For the Cats’ final six contests to turn out better than their first six, continued improvement at wideout could be key.